This year Aaron and I decided to plant some veggies along the side of our house. We decided on (or Aaron bought and brought home) tomato, cucumber and zucchini plants. The cucumbers did okay for a while and I maybe got a dozen cucumbers. They were awesome, but now the plants have all shriveled up and died. Not sure what happened there. The zucchini plants took off, but never have really produced very many zucchinis. I think I have picked maybe 6 or 7? I wish there were more. I could eat zucchini for breakfast, lunch & dinner. The tomatoes have completely taken off. I have more than I know what to do with. I plan on learning how to do some canning when I meet my Mom & Step Dad to pick up Jon tomorrow. I would love to make my own marinara sauce this fall & winter. So until I figure out the canning, I wanted to try out a recipe that my sister passed along to me a while back, but I never made. 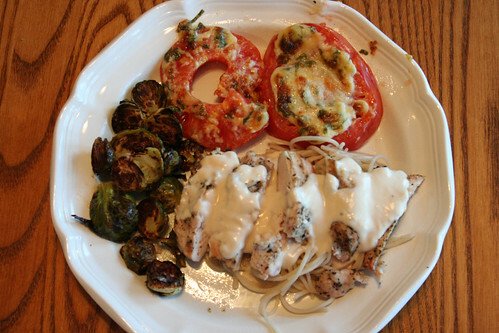 It is called Broiled Parmesan Tomatoes. I asked where she got the recipe and while she isn’t positive, she thought it may have been Southern Living. I had these along with a grilled burger with swiss cheese, mushrooms and roasted red pepper and sweet potato fries (made by Alexia). 2. Core tomatoes. Cut crosswise into 3/4 inch slices. Place in a single layer on rack in broiler pan. 3. Mix mayo, 1 TBSP parmesan, basil & mustard. Spread about 1 tsp mixture over each tomato slice. Sprinkle 1 TBSP parmesan over tomatoes. Bake about 8 minutes until hot. 4. Set oven control to broil. 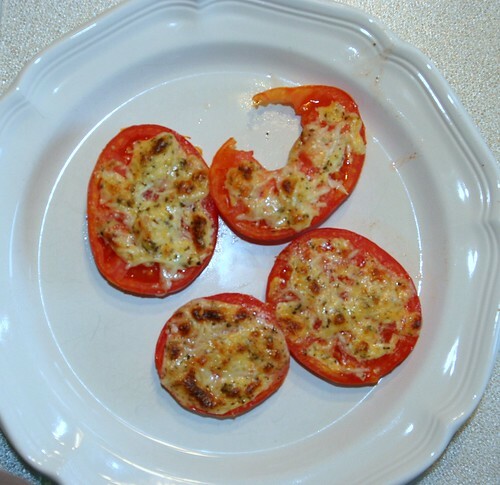 Broil tomatoes with tops 6 inches from heat for 2 to 4 minutes or until topping is golden and bubbly. **I cut this recipe in half b/c I knew that I was the only one who would eat it and Kelly (sister) didn’t recommend reheating the next day. These were so very good. I know that I always say everything is great, but I wouldn’t share things I didn’t like. 😉 Great use for all of those tomatoes coming out of the garden now. Great dish to serve at a cookout for the upcoming Labor Day weekend!